Key terms: Allelopathy; Gallic acid\Fusarium oxysporum f. sp. niveum; Plant-microbe interaction; Virulent factors. Watermelon production in the long-term monoculture system has been limited due to frequent occurrence of fusarial wilt by Fusarium. oxysporum f. sp. niveum, which is very difficult to remove from soil once it has been introduced (Booth 1971; Wu et al. 2007a,b). It is the most important soilborne pathogen limiting watermelon production in many areas of the world (Martyn 1996; Wu et al 2007a, b). Fusarium species are a genus of harmful fungi that cause vascular disease in plants, such as watermelon, cucumber, tomato, pepper, muskmelon, bean and cotton (Armstrong and Armstrong 1981; Gordon et al. 1997; Nelson 1981). Most of them are toxigenic and produce deleterious secondary metabolites (Marasas et al 1984), damaging host plants through penetration of hyphae into host vascular tissues, secretion of hydrolytic enzymes related to pathogenesis, mycotoxin production and cellular apoptosis of host plant cells in the progression of the infection (Gaumann 1957; Abbas et al. 1997; Bacon et al. 1996; Pavlovkin etal. 2004). Much study has been focused on the effect of F. oxysporum f.sp.niveum on host plants. Little attention has been given to the effect of the host plant on the pathogen. It has been found that many kinds of root exudates and decaying residues (decomposing litter) are phytotoxic as the result of allelochemicals contained in root exudates and decaying residues that have been isolated and identified as organic acids, especially phenolic acids, such as cinnamic, vanillic, coumaric, and ferulic acid (Lee et al. 2006; Hao et al. 2006; Ohno et al. 2001; Yu et al. 2003). Phenolic acids frequently occur in plants, such as hydroxycinnamic acids ester-linked to polysaccarides and large amounts of simple phenolic acids are released during the aerobic catabolism of lignin (Kuwahara 1980; Toms & Wood 1970). The effects of root exudates and decaying residues on methanogenic microbial communities on rice or maize roots and in the rhizosphere (Lu et al 2004; Baudoin et al. 2003), bacterial community composition (Landi et al. 2006; Sturz 2006), microbial biomass (Sung et al. 2006), stimulation of ginseng root exudates on growth of Phytophthora cactorum and Pythium irregulare (Nicol et al. 2003), rhizobacterial populations (Nehl et al. 1997; Sturz and Christie 2003) and fungal species abundantly rich in the desert (Mandeel 2002) have been studied. Some studies have found that root exudates might initiate and manipulate biological and physical interactions between roots and soil organisms, and thus play an active role in root-microbe communication (Bais et al. 2004). However, the role of specific compounds from root exudates or decaying plant residues in plant-microbe interaction is almost unknown, though artificially applied chemicals, such as ferulic, caffeic and vanillic acid added to the soil to test for the effects of phenolic acids on microbial biomass and populations had been discussed (Sparling et al. 1981; Blum 1997). Higher plants synthesize various secondary metabolites including tannic acid and its derivatives, such as ellagic or gallic acid (Lin et al. 2004). Gallic acid (3,4,5-trihydroxybenzoic acid,) may be considered as one of the simplest models for natural organic matter (Quici et al. 2008) and is one of the organic acids found in plants that exhibit activity against the bacteria Sallmonella typhi and Staphycococcus aureus and other pathogenic microbes (Chanwitheesuk et al. 2007; Hasegawa et al. 2008). It is a precursor of lignin in cell walls and can be hydrolyzed from lignin by tannase (Trevino-Cueto et al. 2007). It has been widely studied as an antioxidant (Lin et al. 2004; Chanwitheesuk et al. 2007; Hasegawa et al. 2008; Soong and Barlow 2006; Abdelwahed et al. 2007). However, little is known about the immediate effect of gallic acid on F. oxysporum f.sp.niveum, i.e. relationships between gallic acid and F. oxysporum f. sp. niveum. Our purpose of this study was to investigate the potential effect of artificially applied gallic acid on the growth and virulence factors by Fusarium oxysporum f. sp. niveum during plant-microbe interactions to evaluate potential risk of gallic acid-driven pathogens to host plants and humans. Fusarium oxysporum f.sp. niveum (FON) was obtained from the Laboratory of Plant-Microbe Interactions, Nanjing Agricultural University, China. Gallic acid and the other main chemicals used in the experiment were obtained from the Sigma Co. (St. Louis, MO, USA). A 5-mm agar plug taken from a 7-day-old PDA (potato dextrose agar) culture was inoculated into the center of a piate and incubated at 28 °C for 7days(d). Colony diameter was measured in three directions on each piate after incubation for 3 and 7 d.
To determine the effect of gallic acid on conidial germination, FON was grown in 2% water agar. A 5-mm agar plug taken from a 7-day-old PDA culture was inoculated in a liquid culture and incubated at 28 °C for 7d. The broth was filtered to collect conidia. Conidial suspension was diluted to <200 conidia per millimeter with sterile distilled water. Some 0.1 mi of the diluted suspension was spread on plates and incubated at 28 °C for 3d. The number of colonies was counted daily. Sporulation was determined following the growth of Fusarium oxysporum f.sp.niveum (as described above) in Bilay and Joffe's medium (Booth, 1971), with minor modifications (4.0 g CMC-Na instead of 15 g CMC, pH adjusted to 4 with 2 mol L1 HC1). After incubation for 7d, 0.1 mi of culture broth, diluted to 10-5 - 10-7, was spread onto PDA. Plates were incubated at 28 °C in the dark for 4 d, after which colonies were counted and converted to the number of conidia in a liquid culture. Fusarium oxysporum f.sp.niveum was grown in 100 mi conical flasks filled with 30 mi potato dextrose broth adjusted to pH 4.5 with 2 mol. L1 HC1 and was inoculated with a 5-mm agar plug taken from a 7-day-old PDA culture. Cultures were incubated in a shaker (170 rpm) at 28°C for 7d. Fungal biomass (dry weight) was determined after filtration and drying at 80°C for 12 h, when constant weight was achieved. Culture filtrate was used for enzyme assays. Protease activity was assayed as described by Tseng and Mount (1974). One unit of enzyme activity was defined as a 0.001 increase in absorbance per minute under the assay conditions. Pectinase activity (mainly polygalacturonase) was assayed by the DNS method (Silva et al. 2005). One unit of enzyme activity was defined as the amount of β-galacturonic acid hydrolyzed from pectin per minute under the assay conditions. Cellulase activity was also determined by the DNS method (Berlin et al. 2005). One unit of cellulase activity was defined as the amount of enzyme that produced 1μmol of reduced sugar per minute under the above assay condition. Total amylase activity was assayed by the DNS method (Murado et al. 1997). One unit of amylase activity was defined as the amount of enzyme that releases 1 mg of reducing sugars (glucose equivalents) per minute under the above assay conditions. Mycotoxin production (mainly fusaric acid) was determined following growth in Richard's medium (Gaumann 1957), as described above, but with a 12 h photoperiod under fluorescent light for 35 d. Broth was acidified to pH 2 with 2 mol L1 HC1, mixed with an equal volume of ethyl acetate, vigorously shaken for 2 min, allowed to settle for 30 min and the organic phase removed. After repeating this procedure 5 times, the organic phase was centrifuged for 10 min at 5000g. The supernatant was dried and condensed at < 40°C. The dried residue was redis solved in 5 mi of ethyl acetate and the OD268 (Matsui and Smith 1988) was determined by UV spectrophotometry (UV-120-02 spectrophotometer Shimadzu, Japan). Based on our preliminary experiments, studies were carried out using five concentrations of gallic acid: 0, 50, 100, 200, and 400 mg. L1. The control was 0 mg. L1 of gallic acid, but with 2 mi of sterilized methyl alcohol-ethyl acetate instead of gallic acid because gallic acid dissolves in a mixture of methyl alcohol-ethyl acetate. Gallic acid solution was filter-sterilized by a 0.22 [im pore membrane (Millipore). Data were analyzed by Microsoft Excel. The values were represented as the mean of three replicates (mean±SD) for each treatment. One way ANOVA was used and comparison of means were conducted when significant difference was tested by Duncan's multi range LSD at p<0.05.with SPSS version 11.5(SPSSCo.,IL.USA). Biomass of Fusarium oxysporum f.sp.niveum was significantly stimulated by gallic acid in a liquid culture, but inhibited its colony growth on PDA plates. Compared to the untreated control, the dry weight of mycelia increased by 70.0-121.0% (Fig. 1), the colony diameter decreased by 5.7-22.9% (Fig. 2). Figure 1: Effect of gallic acid on biomass of Fusarium oxysporum f. sp. niveum. Figure 2: Effect of gallic acid on colony growth of Fusarium oxysporum f. sp. niveum. Conidia germination on a piate and conidia formation in a liquid culture was significantly inhibited. The number of germinating conidia was reduced by 35.8-55.6% (Fig. 3), while the number of conidia produced declined by 38.9-62.2% (Fig. 4). Mycotoxin production of Fusarium oxysporum f.sp. 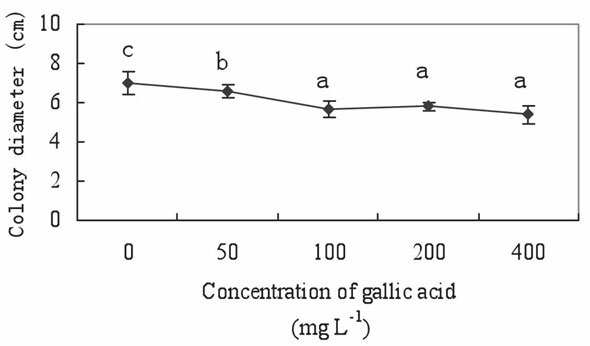 niveum in a liquid culture was significantly inhibited by gallic acid in a concentration-dependent manner. The yield of mycotoxin was decreased by 2.4-59.8% compared with control (Fig. 5). Gallic acid stimulated the activity of pathogenic enzymes in the present study. Pectinase activity increased by 12.3-627.8% in liquid culture (Fig. 6a). A substantial increase of the proteinase activity was observed with treatment by ferulic acid. 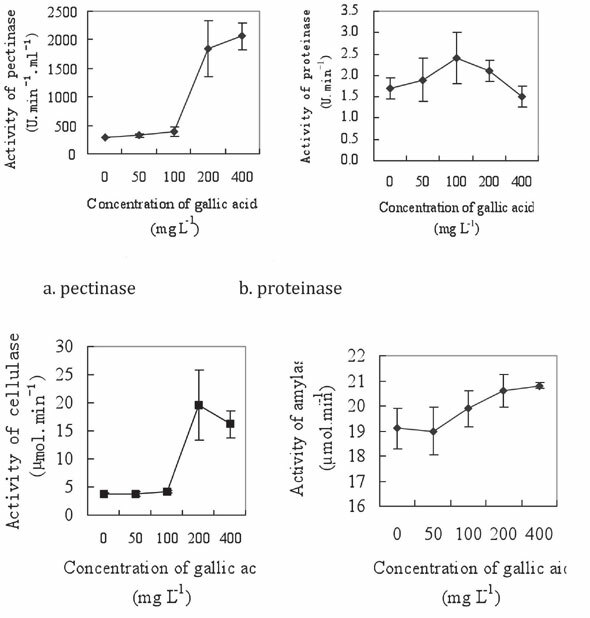 The proteinase activity initially increased at concentrations of 0-400 mg L1, with a rise of 11.8-41.2% but decreased at higher concentration of gallic acid (Fig. 6b). 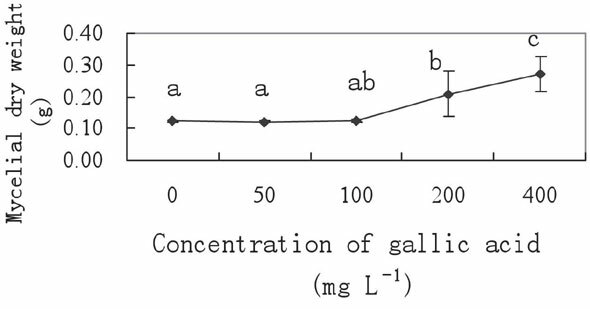 Stimulation of cellulase activity was obtained with increasing concentrations of gallic acid, with activity increasing by 0.5-325.0% (Fig. 6c). A slight increase of cellulase activity was found (Fig. 6d). Figure 3: Effect of gallic acid on conidia germination of Fusarium oxysporum f. sp. niveum. Figure 4: Effect of gallic acid on sporulation of Fusarium oxysporum f. sp. niveum in a liquid culture. Figure 5: Effect of gallic acid on mycotoxin production of Fusarium oxysporum f. sp. niveum. Fusarium oxysporum f. sp. niveumin a liquid culture. Bars indicate standard deviation of three replicates. Gallic acid is a normal metabolite found in plants, which is often detected in the root exudates and plant-grown soil (Wu et al. 2007a,b). There are some relationships between gallic acid and soil microorganisms and pathogens that affect the soil microbial community and ecological functions. In the present study, results showed that the mycelial growth of Fusarium oxysporum f.sp. 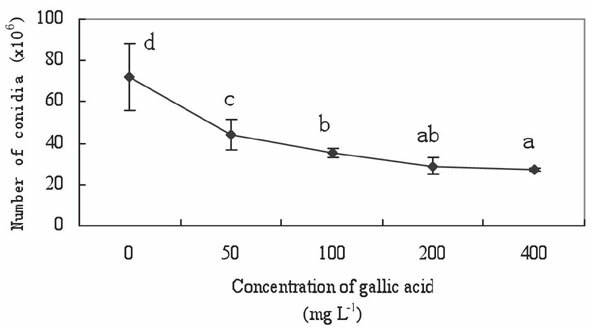 niveum in plates was inhibited by gallic acid in a concentration-dependent manner, with the colony diameter decreasing by 5.7-22.9% compared to the control (Fig. 2). However, the mycelial growth of F. oxysporum f.sp. niveum in a liquid culture was stimulated, with the mycelial dry weight increasing by 70.0-121.1% (Fig. 1). This has also been confirmed by the result that the mycelial growth of the F. oxysporum f. sp. albedinis is inhibited by cell wall-bound phenolics in date palm roots (Elmondafar & Boustani, 2001). This was consistent with coumaric and cinnamic acid inhibition of hyphal growth of F. oyxsporum f.sp. niveum (Wu et al. 2007a, b). However, the results are in disagreement with the absence of inhibition of Fusarium spp by gallic acid from Caesalpinia mimosoides Lamk (Chanwitheesuk et al. 2007). The difference in mycelial stimulation or inhibition between piate and liquid culture results from the physiological mechanisms under the two culture conditions. In the current study, gallic acid dramatically stimulated conidia germination and formation of the fungus. The conidia germinating rate and the yield of conidia were reduced by 35.8-55.6% and 38.9-62.2% respectively (Fig. 3). This was not in accordance with the coumaric acid inhibition of F. oxysporum f. sp. niveum (Wu et al. 2007a). Though gallic acid stimulated the biomass of F. oxysporum f.sp. niveum in a liquid culture, eventually the growth of the fungus was inhibited due to the simultaneous inhibition of conidia germination and formation. Furthermore, gallic acid affected the virulence factors and pathogenesis of the fungus. 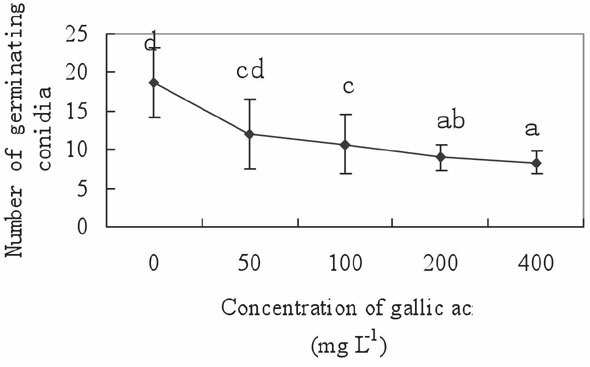 Mycotoxin production was heavily restricted by gallic acid in a concentration-dependent manner (Fig. 5). A fall of mycotoxin production implied a reduction of fungus virulence to the host. This was confirmed by the report that the mycotoxin production of F. oxysporum f. sp. niveum was suppressed by coumaric acid (Wu et al. 2007). As a powerful defense, mycotoxin is produced when FON invade watermelon or other plants, which is an important pathogenic factor causing plant wilting (Gaumann 1957). Moderate fusaric acid (a fusarilal mycotoxin) doses induce apoptosis in saffron, while high fusaric acid doses stimulate necrosis (Leili & Behboodi 2006). However, gallic acid increased pathogenic enzyme activities. In this study, the activity of pectinase, proteinase, and cellulase increased by 12.3-627.8%, 11.8-41.2% and 0.5-325.0% respectively (Fig. 6), while the activity of amylase was slightly elevated. 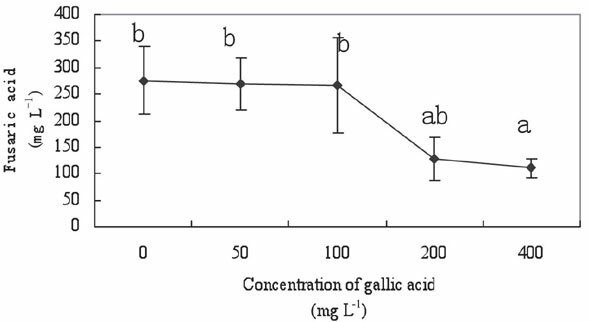 This indicates that gallic acid enhances the virulence of F. oxysporum f. sp. niveum against the host. This is in accordance with cinnamic acid increasing pathogenic enzyme activity by F. oxysporum f. sp. niveum (Wu et al. 2007b). Other virulence factors equally important for FON are the enzymes related to pathogenesis. Pectinases and cellulases of phytopathogenic fungi stimulate the infection process in many plant diseases. They facilitate the penetration of the fungus into the plant by the hydrolytic cleavage of polymers (pectic substances, cellulose), which constitute the plant cell walls (Fuchs et al. 1965). Fusarial fungi damage host plants through penetration of hyphae into host vascular tissues, secretion of hydrolytic enzymes related to pathogenesis, and mycotoxin production in the progression of the infection (Fuchs et al. 1965). Gallic acid inhibited Fusarium oxysporum f. sp. niveum in this investigation, which might be responsible for host resistance against the pathogen during biotic stress. This work has been financially supported by the Jiangsu Key Lab for Solid Organic Waste Utilization (2007001). Received: September 30, 2008. In Revised form: June 14, 2009. Accepted: July 8, 2009.